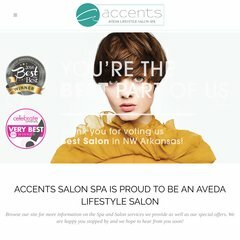 Topics: Accents Salon Spa, Gift Certificates, New At Aveda, Shop Aveda, and Salon. Age: It went live on August 24th 2005, making it over 12 years, 7 months old. It is hosted by Adobe Systems Inc. California, using Microsoft-IIS/7 web server. It is written for ASP.NET language. ns01.hotwiresite.com, ns02.hotwiresite.com, and ns03.hotwiresite.com are its DNS Nameservers. A ping speed test response, is timed at 1058 ms.